The chairman of the US Federal Reserve, Ben Bernanke, has warned that the country's creditworthiness is at risk if its borrowing limit is not raised. He said the US could lose its coveted AAA credit rating if Congress did not vote in favour of lifting the $14.3 trillion (£8.7 trillion) debt ceiling. If there is no deal by August, the US may start defaulting on obligations. Vice-President Joe Biden and congressional leaders have resumed efforts to find a bipartisan solution. They are trying to reach an agreement that would tie spending cuts with an increase in the debt limit. They are expected to discuss annual spending levels, budget process reforms, taxes and healthcare benefits. "We're making real progress, we're down to the tough stuff now and everybody's still in the room," Mr Biden said after Tuesday's meeting. President Barack Obama and the Speaker of the House of Representatives, John Boehner, want an agreement by 4 July. At a conference on Tuesday organised by a think tank, the Committee for a Responsible Federal Budget, Mr Bernanke said any delay in the US government making payments could cause chaos on global financial markets. Public debt was $14.3tr on 31 May, up from $10.6tr when Mr Obama took office in January 2009. 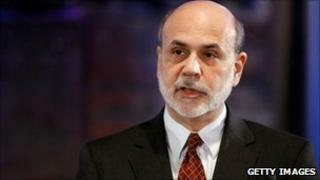 It could also damage the dollar's status as a reserve currency, he warned. Mr Bernanke said he understood the desire of many politicians to use the deadline to force some necessary and difficult policy adjustments, but said the debt limit was "the wrong tool for that important job". "Failing to raise the debt limit would require the federal government to delay or renege on payments for obligations already entered into." "Even a short suspension of payments on principal or interest on the treasury's debt obligations would cause severe disruptions in financial markets and the payments system." In addition, Mr Bernanke said US government debt risked being downgraded, creating fundamental doubts about the nation's creditworthiness. Long-term damage to the "special role" of the dollar and of treasury securities in global markets was also possible, he said. Instead of allowing a default, Democrats and Republicans needed to develop a credible long-range plan to rein in the nation's budget deficit, Mr Bernanke added. An increase of $2.5 trillion would allow the government to operate until early 2013. He suggested stabilising the deficit as a proportion of the total economy, and lowering the figure over time. Deficit-reduction goals should be set and enforced with a mechanism triggering automatic cuts.